Ascertain a solid technical foundation in portrait lighting and retouching with instructors Oscar & Jessica Lozoya as they present their full day photography class that they have presented internationally to professional photography associations. This intense, hands on photo workshop is information packed and held at Lozoya Studios in Albuquerque. The small class size allows for questions and answers to help you better understand lighting for portraiture. This is your chance to learn portrait photography from two Masters at what they do best, in their environment! Oscar and Jessica have both earned the Master of Photography and the Photographic Craftsman Degrees from the Professional Photographers of America and Jessica has earned the Master Artist Degree. The day begins with a nuts & bolts approach to understanding strobe lighting including equipment, individual lighting components, lighting patterns, ratios, quality of light, how to use light to either flatter or enhance character, how to use light to create a 3D effect in portraiture, as well as the science behind how light functions all the way thru to the discussion of advanced lighting set-ups. Oscar Lozoya will demonstrate how he lights for portraiture using his the multiple lighting style that has earned him some of the highest accolades in the professional photography industry. Among them are; Photographer/Director of the Year 18 times in New Mexico, 44 images accepted into the National Loan Collection, 3 Regional Medallion Awards from the American Society of Photographers, 40 Kodak Gallery Awards for Photographic Excellence and 24 Fuji Masterpiece Awards. He has had articles published on his work in Shutterbug, Rangefinder, American Photo and Professional Photographer Magazines. Oscar's work has been used in publications to promote products for companies including; Eastman Kodak, Fuji Film, Speedotron, Morris Lighting Co. and Photoflex. Participants will be able to work hands-on, using studio strobe lighting and with Oscar there to give personalized instruction. Using images just captured, attendees will learn portrait retouching-techniques using Photoshop. Master Artist Jessica Lozoya will demonstrate her workflow for beauty retouching while participants work on their images right along with her. Topics will include using time saving shortcuts, using layer masks, blending modes, realistic skin healing, hair smoothing, eye enhancement, minimizing shine, how to create a custom brush and other retouching methods that she has perfected over the years. Jessica's approach to retouching is to enhance the person's appearance while still maintaining the quality of light and the overall integrity of the subject. This style has helped her earn the best entry for Electronic Imaging 8 times in New Mexico, the State Elite Award from the American Society of Photographers, 9 Kodak Gallery Awards for Photographic Excellence and 9 Fuji Masterpiece Awards. Class size is limited to 8 in order to provide personalized attention and allow for questions and answers. Lunch will be provided. Minimum of 4 attendees are required for the workshop to be held. 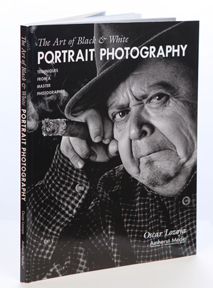 "The Art of Black & White Portrait Photography"
by Oscar Lozoya is published through Amherst Media. This comprehensive educational book explains how Oscar Lozoya created some of his highest award winning images, complete with lighting diagrams with over 100 images. In addition to discussing Oscar's singular style of dramatic lighting, other topics include composition, subject selection and the creative process. Mentoring Sessions are a great solution for targeted learning on the topics of your choice. Mentoring Sessions Must be Pre-Paid to Schedule. Scheduling is based on availability. Once a Mentoring Session is scheduled the Studio shall reserve the time and date(s) agreed upon and will not make other reservations for that time and date(s). For this reason; in the event of a postponement, cancelation, termination or no-show of the mentoring session, retainer(s) paid are not refundable and cannot be applied toward future credit. "It was one of the best workshops I have ever attended." - Les P.
"This was an amazing workshop... very fluid in the way it was taught. So much great information. I have a new inspiration." - David L.
"Your workshop helped me to better understand the way light works on any subject any where. And that is truly invaluable." - Cheryl C.
"Clear explanations of not just the technical aspects of studio lighting but also the whys. Jessica and Oscar are such a tremendous wealth of information for any portrait photographer." - Bill E.
"I learned so much from the workshop. It has really helped me in realizing how to go about achieving my artistic vision." - Nancy J. "Your explaination of lighting was to the point and so easy to understand... Such a wonderful day of learning. You both have hearts of teachers and I appreciate so much, the opportunity to have attended." - Linda S.